Chania, apart from beautiful places and green-blue beaches also offers an exquisite cuisine, which is 100% based on products of the fertile Cretan land. The Cretan cuisine has, in fact, been recognized by UNESCO as Cultural Heritage of Humanity. Interesting, huh? So, what would you say about a first-contact meeting with it? You get that right, it is one of the most interesting activities that you can do in this city. We tried it and we have all the best to say about it, as it is a “tasty” and different life experience. The lesson takes place in the only circular building in Chania, which at first operated as a private primary and junior high school. Up there, on the fringes of Chalepa, the founders of the Academy of Gastronomy and Tourism, Manolis Georgiou & chef Joseph Apostolakis, host the Cretan cuisine lesson (currently the Lucerna Hotel). The Academy was created with the purpose of educating young people who love cooking and aspire to become chefs. 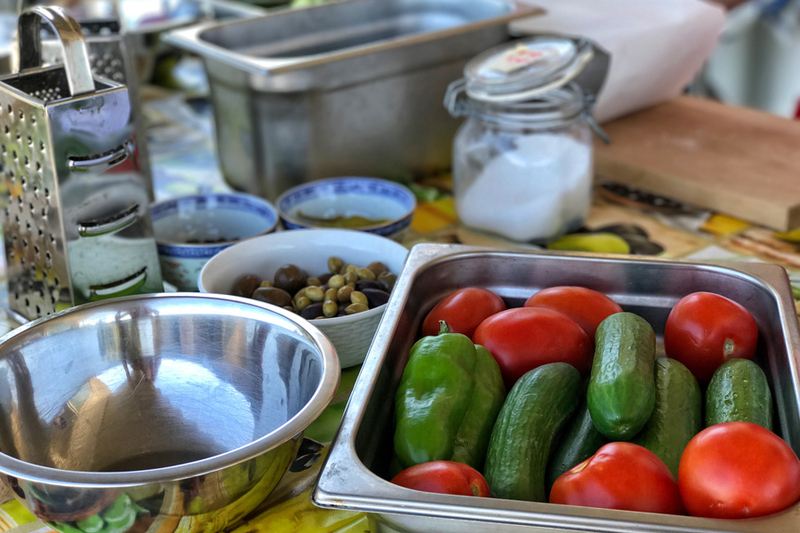 Luckily, the Academy does not stop there, but offers the visitors of Chania the chance to have a complete experience with the Cretan cuisine, helping themselves in the preparation of an entirely Cretan menu. 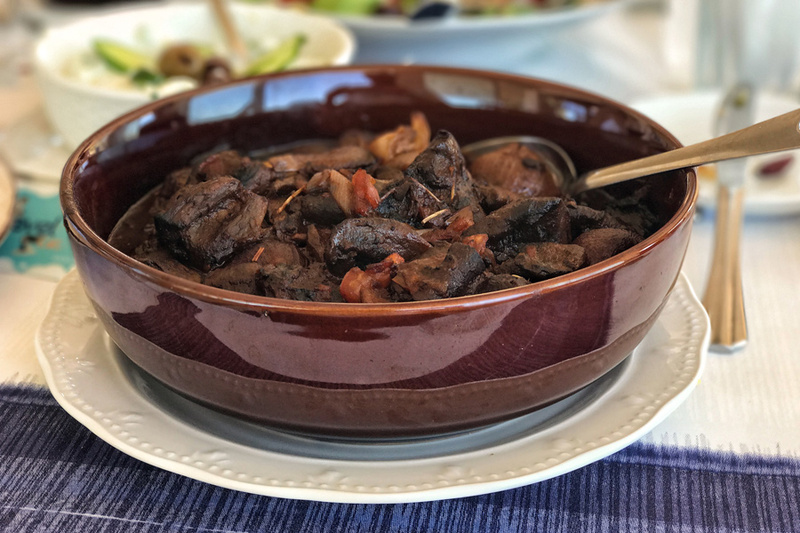 The lesson is kicked-off with a brief introduction of the ingredients, as well as with useful information by the chef, not only concerning the dishes that you are about to prepare, but the Cretan diet in general. Then you will admire the chef simply executing the recipes, while at the same time taking the lid off many secrets about the dishes. You role will soon get more active, as after a while you will grab the ladles, graters, mortars and other kitchen tools, so you can also help in the preparation of the food! 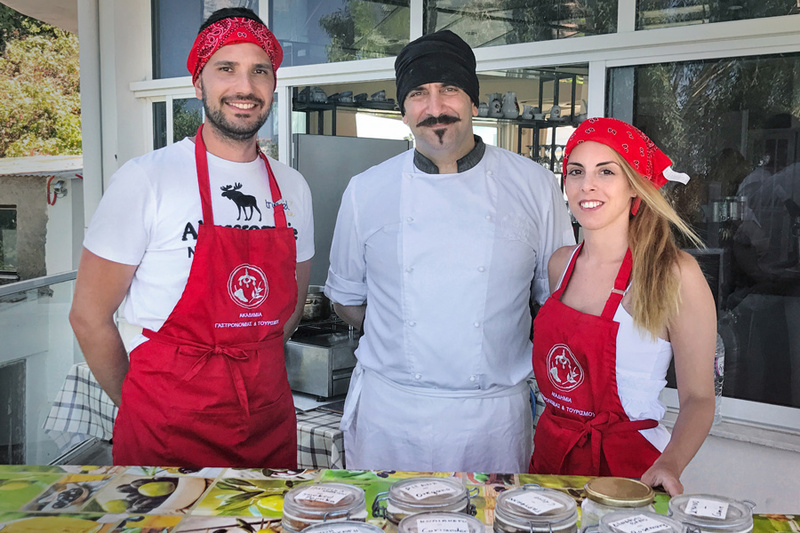 The menu includes Cretan salad, tzatziki, mushroom stew, hortokalitsouna, chicken with spices and yoghurt sauce, goat “tsigariasto” and a cookies dessert made from haroupalevro (kind of flour) with orange-scented mizithra cheese. 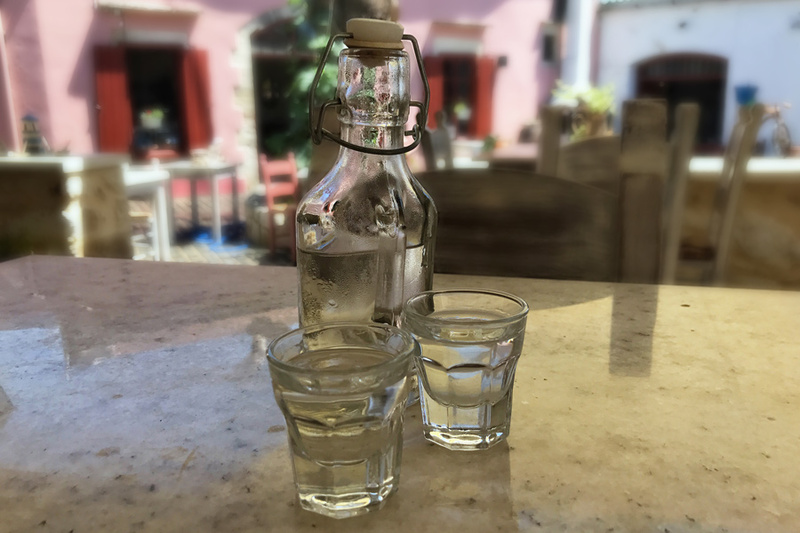 Of course, the Cretan wine and frozen raki could not be missing from the full menu! As you very well understood, the benefits of the lesson are multiple, as apart from the knowledge and great company, you have the chance to enjoy a complete Cretan meal with a view of the entire city! The chef Joseph Apostolakis, with many years of experience with the Cretan cuisine, likes the simple Cretan recipes and his weapon is the abundant Cretan oil and his imagination! He is extremely approachable and communicable, so much so that you don’t want him to stop talking. He has the ability to turn the “lesson” into a pleasant edifying discussion, combining advice on various recipes with special Cretan stories. But do not overdo it with the talking, because the man has also 5-6 dishes to prepare! In the background, we find the man that is the key to this whole thing (mr. Manolis), who makes sure that nothing is missing and everything is always on time and always fresh. He is the soul of the lessons, as he tries, with his love and dreams, to take the culinary experience one step forward. The future gastronomic plans include the creation of daily to weekly activities, with the gastronomic and wine culture of Crete as the fundamental characteristic. The paths of olive oil, the meal in a vineyard, the gastronomic experiences combined with visits to wineries, cheese dairies & other places of interest are some of the ideas that will start materializing soon. As you can see, options are endless when you are in the Cretan countryside, as you literally walk among the menu of the day (hohlioi, lambs, fennels, spearmint, oregano, figs, grapes, oranges, avocados and, of course, olive trees). Stay tuned..